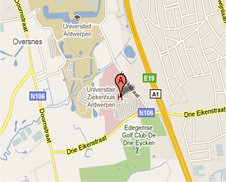 How to contact the Antwerp University Hospital? The car park can be reached via the roundabout at Drie Eikenstraat 655, 2650 Edegem (GPS-coordinates: 51.15500, 4.41220). E-mail: The Antwerp University Hospital does not provide medical information via a general email address. Ask your question to the department you need. If you do not know, you may mail your question to vragen [at] uza [dot] be. Find the Belgian emergency numbers via www.112.be. To call an ambulance, dial 112. For a medical emergency you do not need an appointment. Report to the emergencies department ('spoedgevallen') with an urgent medical emergency.